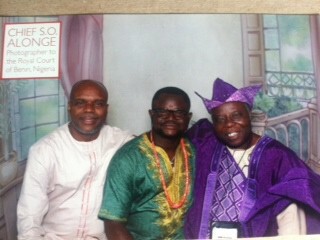 Remarkable New Smithsonian Show Part of Nigerian 100th Anniversary Celebration! ← ARTISTS’ TALK: Friday, Sept. 12 – 7-9 p.m.
Solomon Osagie Alonge (1911–1994) is one of Nigeria’s premiere photographers and the first official photographer of the royal court of Benin, Nigeria. His work spans half century and presents a dynamic continuous record of the reigns of Oba Akenzua II (1933–78) and Oba Erediauwa (1979–present) and the political and social events surrounding the royal palace. 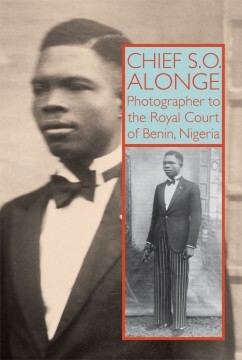 For five decades, Alonge photographed the royal wives and children, visiting dignitaries and politicians, and annual festivals and court ceremonies from a unique insider’s perspective. “Invasion 1897” filmmaker Lancelot Oduwa Imasuen sits between lead actor Mike Omoregbe (left) and visual artist Tunde Odunlade. 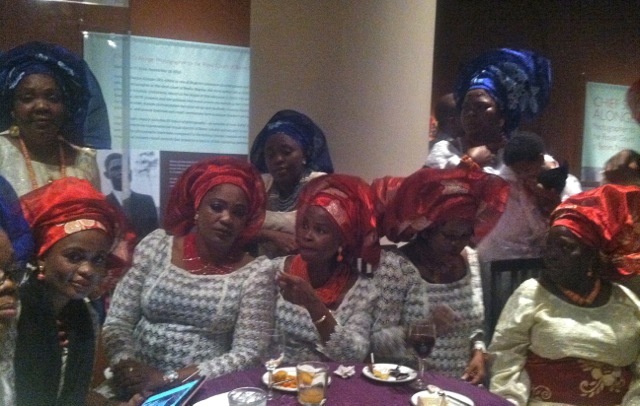 Children and grandchildren of the late S. O. Alonge at the Smithsonian Museum of African Art exhibition opening reception, Sept. 16, 2014; Washington, D.C.